Each year we introduce some new and exciting varieties that we hope gardeners will try and enjoy. Many of you tried the new sunflower, Sunfinity, available for the first time last year that is great for a porch or deck as well as in the garden. It is rather short and has multiple flowers all summer long!! The thunbergia line now has five colors this year. 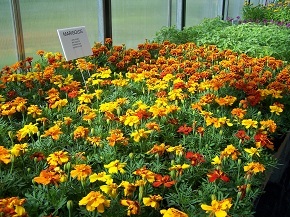 The color palette of calibrachoa has expanded to cover the entire rainbow, and more. There is now a new larger Gerbera with manly large blooms. A new tropical is Colocasia (elephant ears). We have added argyranthemum, a large daisy type flower available in yellow and in pink. We are again offering some of the most popular items from the Proven Winners line. To go with the immensely popular "Bubblegum" and " Picasso in Purple" trailing petunias there is now a new hot pink called Vista Paradise. A great container focal point" Prince Tut" grass. is back, also. We will again have air plants in hanging containers as well as many new succulents individually and in decorative bowls. 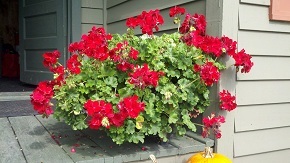 Of course, all your favorites are here including the always popular Calliope Geraniums. There are many trailing plants and foliage only plants to complete your garden and container designs. We regularly attend trade shows and greenhouse conference so that we may stay current with the latest varieties and growing techniques. We take pride in working with each person to meet their needs and offer sound information, ideas and tips. We have spent good deal of time reading about and attending workshops to increase our knowledge on the use of biocontrols to fight insects and foliar diseases rather than the use of chemicals. 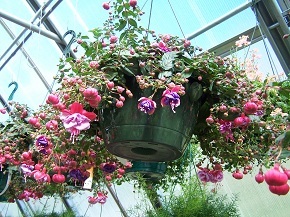 In addition to individual and boxed plants, we have many hanging baskets of begonias, black eyed susan vine, calibrachoa, geraniums, lophospermum, tailing pansies, scaevola and more. A variety of pre-planted containers is available as time allows. We love to do custom containers and basket plantings. Let us work with you in putting together the perfect look for your home. We can help decide what looks good together and, just as important, what will grow well together. You will also find potting soil, a selection of unfilled containers, fertilizers, various insecticides and fungicides many of which are organic. In the decorative area we carry wind chimes, hummingbird feeder for the window, ceramic flower pots and birdbaths. Feel free to wander the grounds and the greenhouses. Below are the varieties that we plan to have available for spring 2019..
Click HERE for directions to Heywood's Blueberries and Greenhouses.